I love this! O and i are looking for a house, and everytime I tell him how I want to rip out the upper cabinates he gets all sweaty, like where are we gonna stuff stuff? But I will convince him, oh yes I will. 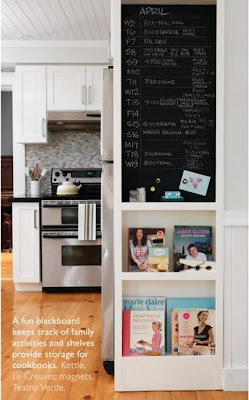 The blackboard in that one pic is really simple and i like how the books are placed beneath it...very nice! I'm a fan of the tile! Love the gray with the white trim. what a great kitchen!!! Love your blog! I've added that last photograph to my "kitchen file". Love the use of space there. Super clever and super cute.